Pay TV had a really bad first quarter this year, with cable companies losing an estimated 263,735 subscribers from New Year’s Day to the end of March, according to the Leichtman Research Group. Satellite TV providers and phone companies with a TV business gained some subscribers during the same time period, but fewer than in previous first quarters, and one of the culprits seems to be cord cutting. A bad first quarter is notable for the industry because that’s when it is usually the strongest. The industry added an estimated 445,000 subscribers in Q1 of 2012, and 470,000 in Q1 of 2011. But even with additions from satellite and phone companies, this year’s first quarter was only up around 194,000 – not enough to make up for previous-quarter losses. Cable has been bleeding for years, and it’s no surprise to see this continue – even though many had expected a stronger showing for Comcast (s CMCSK) and Co. But really concerning is the slowing growth in the satellite TV segment, which is where price-conscious consumers have been fleeing to in previous years. DirecTV (s DTV) added 184,000 subscribers in Q1 of 2011, and 81,000 in Q1 of 2012. This year, it only gained 21,000 new subscribers in the same time frame. Things didn’t look better for DISH, (s DISH) which dropped from 104,000 subscribers in Q1 of 2012 to 36,000 in Q1 of 2013. That’s a sign that people aren’t just looking for a cheaper pay TV option anymore, but actually want to get rid of the traditional pay TV bundle altogether. Been living without cable TV for nearly 2 years now. I am happy I don’t have to pay the $80 a month for mostly channels I don’t watch. Now I get TV from OTA (free) and watch other programs (mostly all free) via the internet on various websites with my computer. I just cancelled my pay-tv, got fed up with the garbage programming and escalating costs. I get 73 over the air HD channels and have Netflix. I only wish I switched years earlier. i went to over air hd antenna and movies and tv shows from internet, had enough of the over priced garbage cable offered, out of channel selection cable had i only watched maybe 10 channels , and that sure the hell was not worth the price they charged, so glad i did this, just wish i did it years ago and saved a bundle. I keep reading these numbers and find it hard to 1) believe they are precise, and 2) equate to any trend. Personally, I pay attention to two things: 1) How many people I personally know who do not have a premium entertainment provider, and 2) the number of people I know who are considering terminating their relationship with a premium entertainment provider. The answer to both questions is zero. I am the only person I know who has a Roku. I have never heard another human being use that word in a sentence. I know a lot of people who have Prime and most do not cite the video service as a benefit. I know one family, besides mine, that subscribes to Netflix. What comes with a premium entertainment provider is good support. When I had Dish and Comcast, if something didn’t work, I called an 800 number and a guy came to my house and fixed it. He didn’t blame the internet or my router or my neighbors — he just fixed it. As long as most people need that level of support, cable cutters will be few and far between. AT&T’s gain are temporary as they have lured customers with lower prices. After a year their prices jump through the roof, they change channel lineup without customers consent, in summary they loose customers like me. For watching a maximum 100 hours of non air TV, if the cost is about $1 per hour, which contains 50% commercials, so, I pay 50 cents per hour to watch commercials, or $2 per hour for content, and if include my compensation for watching commercials at minimum wage, the cost per hour will be $10 per hour. That’s why cord cutting makes sense. Overpriced. Terrible front ends and horrible service. The provider that let’s people have it their way at the right price will win. We’re talking telcos, right? I guess it goes for all vertically integrated service providers with unsustainable models in the face of horizontal and digital approaches that cut across demand silos. Yes I want HONEY BOOBOO, motorbike family quarrels, hee-haw rejects, and the real hookers of whatever City! Please charge me very much money for this art & entertainment, or history coverage. Blame the coverage of “real life” programming. Glad to see pay TV growth slowing. Cord cutting will increase as cable TV subscription prices rise. TV has become a wasteland of reality garbage. This study does not reveal the numbers for what has been labeled “cord shaving” — people downsizing their programming packages. Five years ago, you might have taken Dish Network’s “everything pack” for ~$80 a month. You got your movie channels, and all the cable networks. Then you got Netflix. For $10/month, you got a selection of commercial free tv shows, and some movies. So do you really need that big programming package anymore, or could you scale it back to just the basics? So then you switch to the AT120 plan for $25/mo. You get your sports, news, kid channels, and the usual players. You may even cut back on the number of receivers on your account. Doesn’t AT&T include internet only subscribers in it’s U-verse total? You’re taking at face value the idea that 80,000 people out of 94 MILLION is substantial? And this when the same industry added back 194,000 in the very next quarter? As for Dish and DirecTV they are getting hurt in the new adds arena by bundling, not cord cutting (an ironic term if ever there was one for satellite). The long-term issue is certainly real: Cord “nevers” are entering their 20s and “just saying no”. But the idea that we are seeing short term aggregate cord cutting is >again< proved false by these numbers. The 80,000 loss is not at all an accurate metric, you’re correct on that. A better metric is Zero TV households. Nielsen (which has a vested interest in reporting a large size of the potential audience) pegs the number at 5 million. But let’s forget Neilsen for a moment and look at the macro trends. Nobody can explain away with cyclical variation and seasonally adjusted voodoo that in the same period MVPD’s lost” 80,000 subscribers, they didn’t gain anywhere near 1.2MM new households. 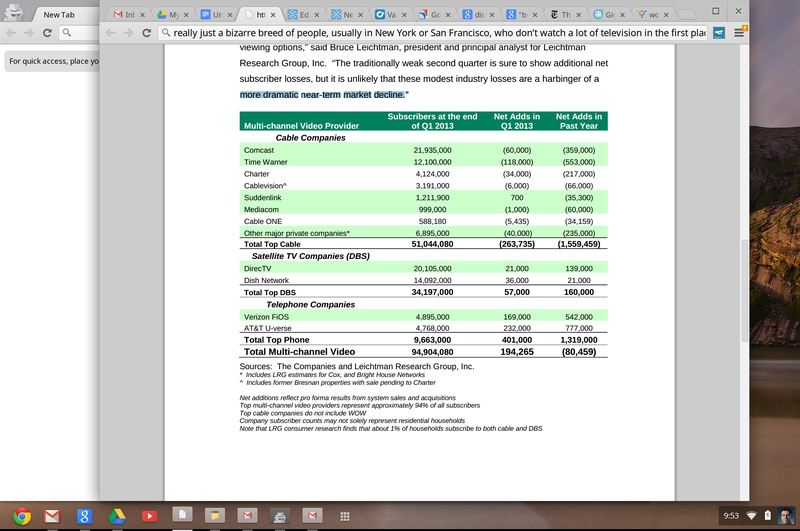 Using only net household additions, and accounting for churn between services (e.g. Comcast vs. DirecTV), what’s happening is a net decline in “TV” households (which Neilsen recognizes and plans to deal with). 100% of the TV Zero households with a device connected to the internet can get (legally or otherwise) all of the content (including sports) that they like. The question is only if the MVPD’s are able to create content packages that they can deliver via unmanaged internet at a margin that they can tolerate. Direct-to-consumer IP delivered content is a brutal business. Netflix has an operating margin of 2.3% and a net margin of 0.6%. DirecTV has an operating margin of 28% and a net margin of 9.7% and Dish has a 9.5% operating margin with a 3.3% net. Amazon’s even thinner, with a 1.7% operating margin and currently at a -0.1% net margin. But IP delivery of content via sVOD and tVOD is definitely where all the growth is, and the opportunity and risk here is for the MVPD to innovate their way to new customers. Mark – you are exactly right. It’s bizarre that Janko would essentially ignore new telco TV subs from the aggregate TV subscription “cord” number. “Cord cutting” as a concept refers to separation from an MSO TV subscription – a switch to fios from TWC certainly does not fit that bill. It’s akin to warning of the death of the delivery industry if FedEx takes share from UPS. We’ve been suckered in by a hyperbolic headline without any reasonable support. Death to Big Cable. Can’t come fast enough. And so it begins… If they can’t get customers, they can’t pay rebroadcast fees. Without rebroadcast fees, NBC, ABC, et al have less incentive to maintain bundling. The pressure from industry groups to prop up hacks with paid for opinions will get stronger then blow away… Awesome times. Glad it’s finally happening. Only about a decade too late. I know my wife and I have definitely had enough of the overpaying for internet and tv and are going to be reducing how much we pay for each. You buy the high-end internet and you get low-end quality. You buy the tier right underneath it and you feel like you have the same speed you have before but also at half the cost. And we are also just going to a basic cable subscription and simply using the internet for shows we want to watch but have to pay four times as much for. We DVR everything anyway, so commercials are a non-factor (well except for that Big Bang Theory is only a 15 minute show, nowadays, and most hour long shows are 43 minutes or less). It would probably be cheaper for us to have an internet-ready tv or run a computer with the tv as its monitor and watch shows that way. The networks and cable companies need to start paying attention to where its customer base is going before they go bankrupt. I have an idea for cable companies – they should let customers choose which channels they want to watch. Sure, some will end up spending less than they are now, but at least they will still be buying something. And I even have a name for this kind of service – a la carte programming. The content providers may not like it, but too bad for them. If they don’t want to keep working with the cable companies, they can cut a deal with Aereo. One other thing I would do if I was running a cable company is build in and turn on a wi-fi hot spot in each cable modem. This would create a wi-fi network with a massive footprint. They could offer free wi-fi service to their subscribers (maybe ones who meet a minimum monthly level), and charge non-subscribers for access to the network. Then they could offer a VoIP app for phones that runs on wi-fi (especially on their network), and compete with mobile networks in urban areas. The incremental cost would be minimal, and they could easily charge $10/mo for the service. The cable operators need to realize that they sell bandwidth, not content. They don’t like that idea, but they should embrace it. There is less risk in selling internet access than in trying to bundle entertainment – hardly anyone is any better at that over a sustained period than they are picking stocks. Given that their competition for wired bandwidth is mostly two arrogant companies who don’t believe in and don’t want to invest in broadband, they can do well.